Another fantastic Compendium of Curiosities Challenge! The 5th challenge can be found on page 39 of A Compendium of Curiosities Vol. III and it's "Distressed Watercoloring." While I can't share how the technique is done (that's for you to discover with your own CC3 book) I am happy to share my creation. For this technique I decided on a 5" x 7" greeting card. The base is a nice bright red Kraft-Core card stock and the rest is across the color wheel using blues and greens. I love using the color wheel as a reference tool when designing projects. I keep one attached to the wall in my craft room. 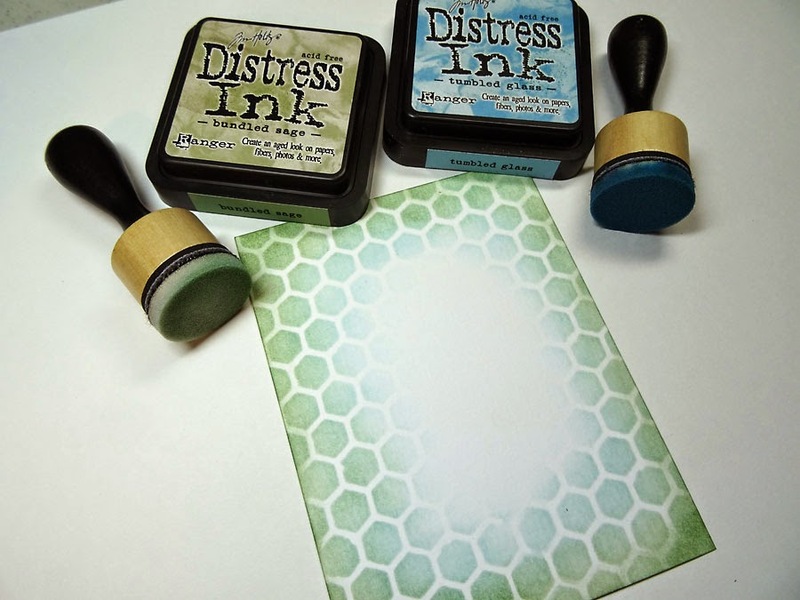 The first step for my card was to color the background of a piece of Distress Watercolor Cardstock with some blues and greens using the honeycomb layering stencil. 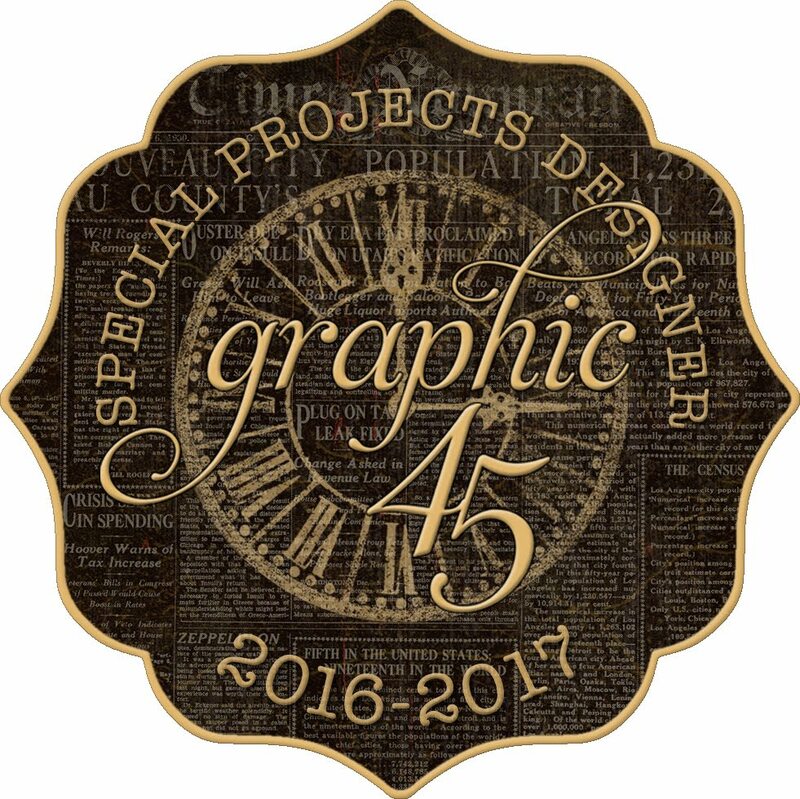 I stopped short of the middle when swirling on the color for my stamped image. Archival Ink is best for this technique since it's waterproof. 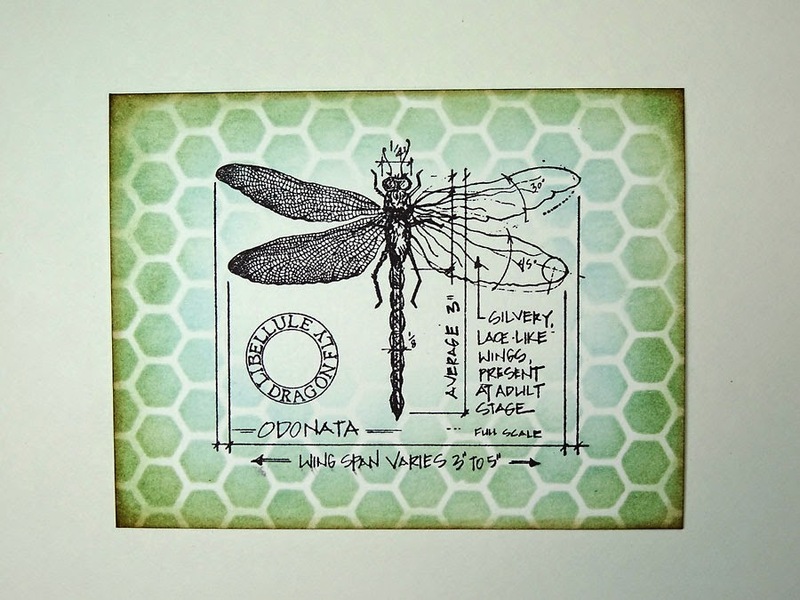 I think this dragonfly is one of my all-time favorite stamps from Stampers Anonymous. Love it! 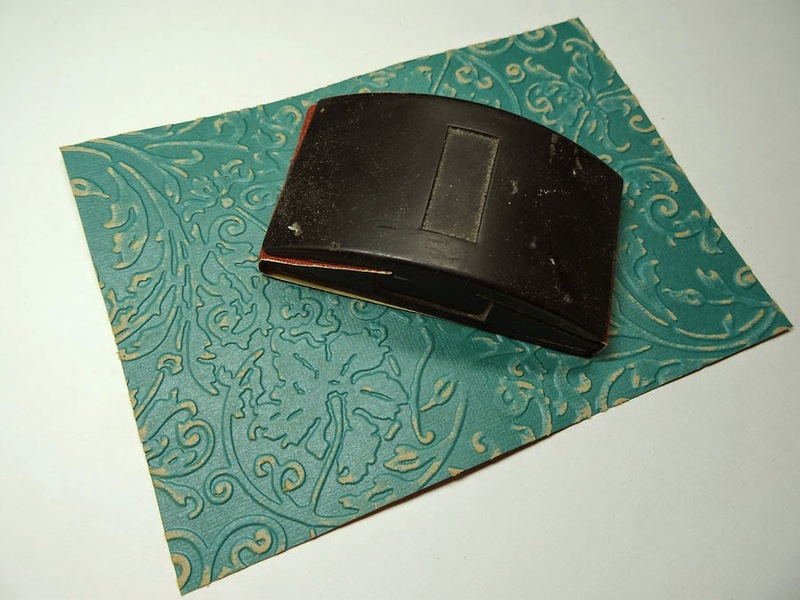 I embossed a sheet of teal Kraft-Core cardstock with the Springtime Background Texture Fade, then sanded the outer areas of the rectangle to reveal the kraft core. Then I hit the raised edges with some Gathered Twigs Distress Ink. I only need to focus on the outer edges since I'll be covering the center of this piece. I mounted the embossed piece flat to my card base, added two layered foliage flowers with a brad to the stamped circle, then popped up the watercolor unit with foam tape to my card. I added Alpha Tiles to spell JOY, stamped a bee and cut him out for the lower right, then painted some metal photo corners from the craft store for the two opposing corners. A few Chit-Chat Stickers added to an Adage Ticket complete my sentiment. I've attached it to a Memo Pin adorned with some natural twine. And as you can see, I added some die-cut Kraft-Core leaves using the Spring Greenery die. Here's another look at my finished card. Now I can't wait to see what YOU come up with! Do you have fabulous Compendium of Curiosities Vol. III book by Tim Holtz? (the master of all things vintage and distressed.) If not, you can find one at your local craft store, scrapbook store, or you can get a signed copy by Tim himself by going here. Now it's your turn to try this fabulous technique. Get watercoloring! These blueprint stamps are perfect for this technique and you have chosen such a beautiful color palette. I love this. Your card is beautiful! I love the dragonfly and bee. What a gorgeous card, Annette - beautiful choice of image and colours, and the whole thing is so elegantly composed - lovely. I love your color combinations and the embellishments are perfect! What a gorgeous holiday piece! Oh I love the muted tones of your card! The way you brought the ink in so the dragonfly looks highlighted! and your watercolor is fabulous!!! So sweet. The way you did your shadow work had me looking twice, three times to make sure this wasn't 3D! Most excellent! Gorgeous card Annette! what a beautiful card Annette! I love the cool greeness of it - like a garden in the shade - your coloring on the dragon fly is wonderful! Love the tag with the word stickers - it really makes it into a sentiment! So much fun looking at all the lovely details on your amazing card. Love the colors! Love the water coloring! Love the layers! I'm going back to look some more! That Dragonfly Legend is one of my all time favorites, too, and your watercoloring is perfect. You know I'm a nature girl, and your card speaks to me!! Love it!! Anette I love the soft feel to your color choices. I love the dragon fly and how it all flows together. Lovely piece and well done. Such a beautiful card. I have been wanting to try making larger cards but have always wondered how to fill up the front. Your card has inspired me to try a 5 x 7 collage type card and step out of my comfort zone of the standard A2 size card. Love this color palette ... so stunning; love the texture of the layers ( all the Tim goodness going on: the embossing, the stencil) love the greenery die... just so much fun going on...oh and the red corners LOVE IT ! The dragon fly is my favorite blueprint stamp!!! Your colors on the dragon fly. Love the soft watercolors offset by the deeper background. This is beautiful!! Absolutely beautiful, Annette! Chock full of yummy details. Love your creativity. The dragonfly is one of my favorite with so many possibilities for water coloring. This is such a beautiful example of perfect watercoloring, Annette! I, too, absolutely love that stamp- almost used it myself! You made it into perfection! Annette, I am such a sucker for the colors you used. All those beautiful layers and I love how you colored the dragonfly. Well done! ohwouw what beautifull! really nice done! and so much different techniques and layers! Oh I love this Annette! Great job! What a beauty. Love the delicate colors of the dragonfly. I love your color choice and the way you stenciled. What a wonderful idea. Thanks for the tutorial also. My favorite piece of all!! I Love everything about it. All of the different elements came together beautifully. I love the dragonfly as a focal point. Annette this is fab. Love the whole thing. So lovely. 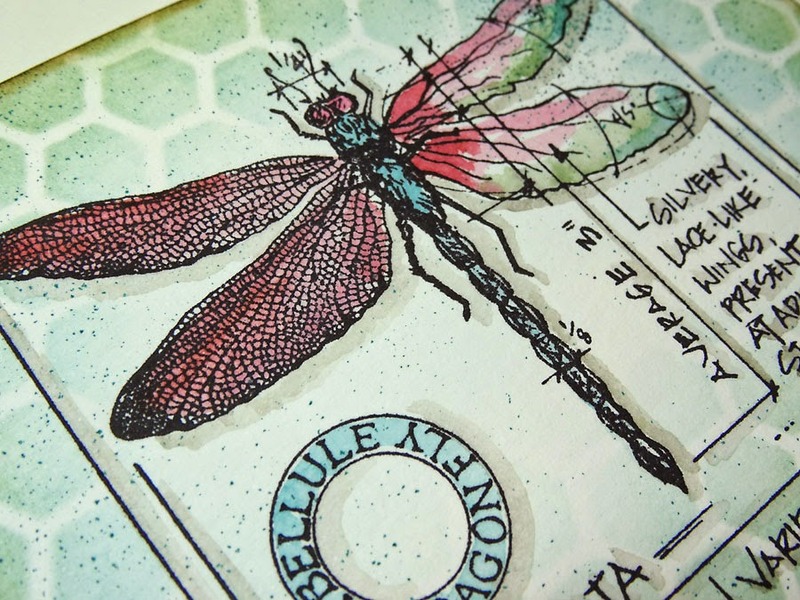 Tim's dragonfly stamp is such a beautiful stamp and your colouring of it is beautiful. Your colour choices show the dragonfly off wonderfully well. This is a great piece of art, I love the cool colour scheme with the flashes of red to give a bit of zing. I agree about the stamp too its one of my favourites although I'd rather not meet a real dragonfly thank you! Wonderful card, loved everything, the coloring, the embossing and all the embellishments! Love this card. The background is awesome and you used one of my favorite stamps. 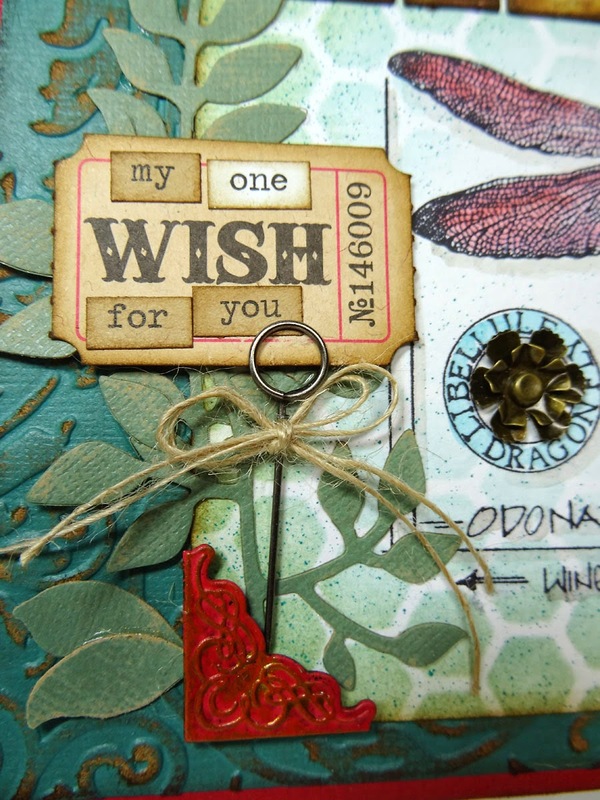 Beautifully put together, love that dragonfly stamp and gorgeous colours used. 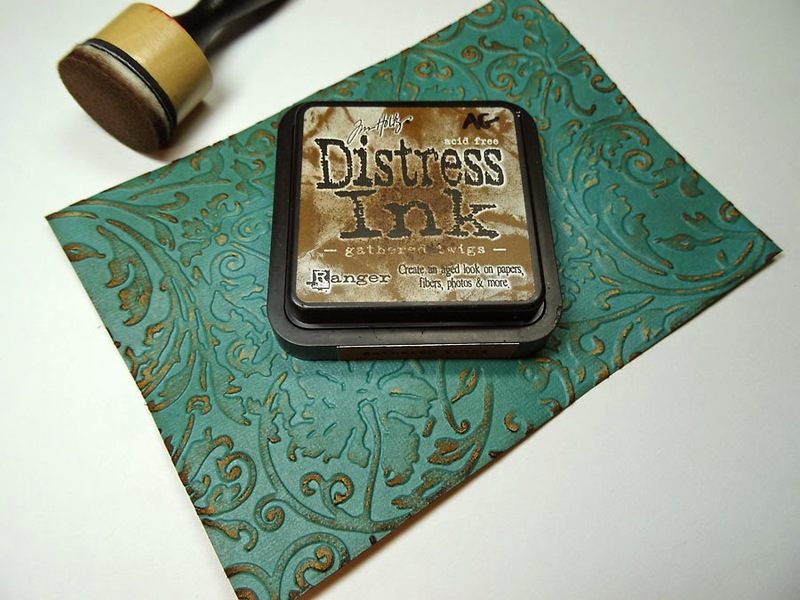 Perfect stamp for a perfect technique from you, with beautiful distress colours. Beautiful layers, Annette! 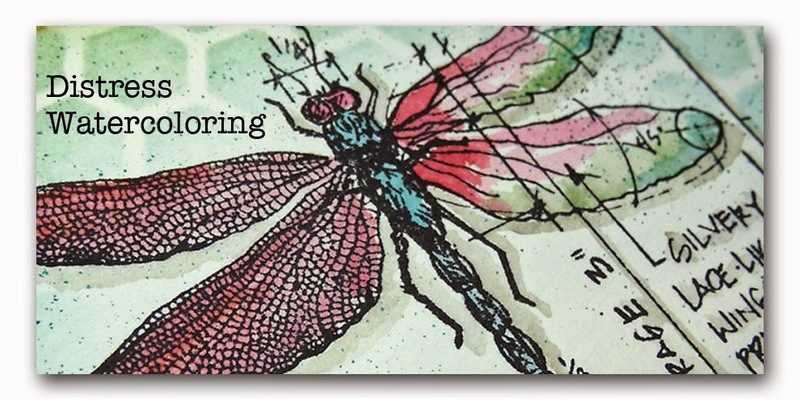 I love the embossing and stenciled layer and that dragonfly is gorgeous! Enjoy! The dragonfly looks so realistic. It's amazing what you can do with a few markers and water! Gorgeous work, as always. Lovely card; so elegant. I'm so glad you mentioned the color wheel; I used to use mine regularly but lost it awhile back during a re-org. Really need to find it again; it can be such a great guide! I love that stamp too ! Now added to my shopping list. I like the embossing and inking very much & the little red corners are a master stroke ! This is just the coolest card! All the little details are just yummy. Love the embossed background! 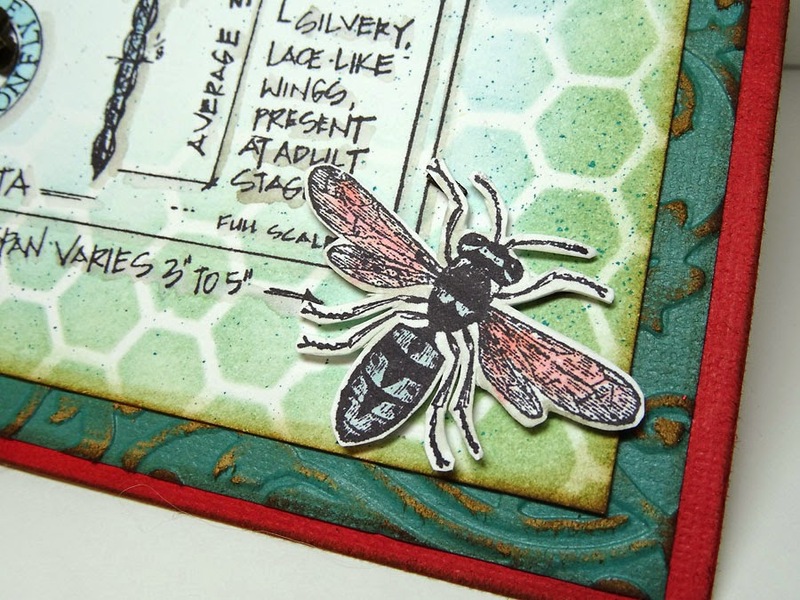 LOVE the dragonfly and the bee and your FAB BG and the embossed kraft core! So much to LOVE! Stunning card Annette! One of my favorite stamps too. The depth, texture, and colors are so pleasing to look at. Love all the great detail. You Bees..me, all the other winged beasties...and yes, one of my fave stamps too. I love all the details you used to pull it all together!And the watercoloring detail is perfect! Thanks again for listing the supplies like you do. I LOVE this dragonfly. I think it's going to be Hugely popular. Love the cool colors . Very serene. I love the stamp and the stencil and the bee. Love all the little details. You make it look so easy! The dragonfly stamp is so perfect for this technique - beautiful project! Love this card, this has to be one of my all time favourite stamps. Absolutely love your dragonfly. I just ordered the die and my nex purchase will be the stamp. Gorgeous colour palette! Red & green's not just for Christmas! This is a fantastic card. 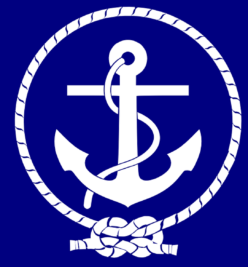 I love how you used the color wheel to determine the colors to be used in the design of it. Love the stamps you used, this is fabulous! Thanks for the inspiration!! Not only do I LOVE your card, I like the way you broke down how you made it, too! Beautiful card, I just love it! This is a beautiful card Annette! I love the dragonfly and that little bee is the perfect touch! What a beautiful card Annette! I love your color choices and wonderful techniques! This piece made me stop and take a second look....my brain immediately went to Christmas because of the colour combination...then I spied the dragonfly and, I swear, you could hear my brain hit the brakes....I love the unexpected and this card did that for me....cool colour choice and quality work...finished with style. thanks for the inspiration! Happy 4th, Annette! Wow, this is a great piece. I really love all of the detailed layering. This is something I am striving for in my own work. I especially love the little bee in the lower corner. Beautiful card! Love the color palette you used. 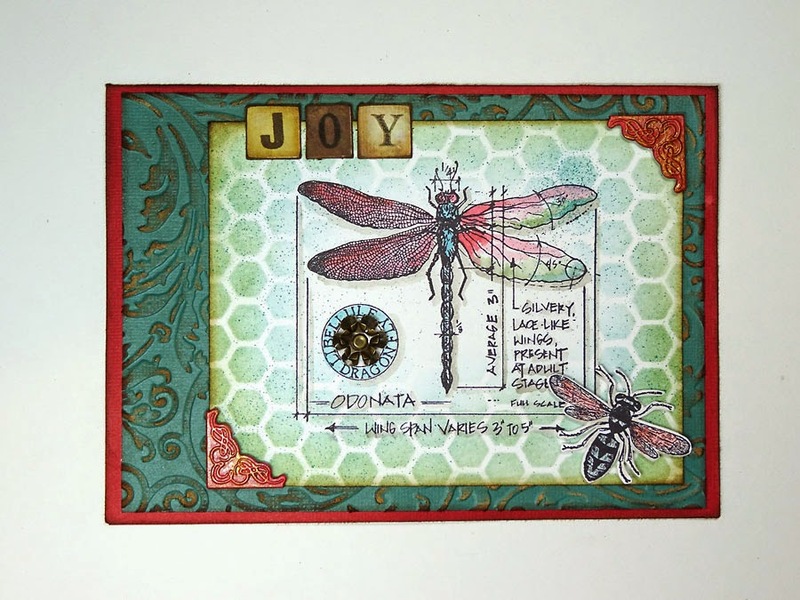 Annette, Love the richness of the colors in your card; and of course the dragonfly. What a beautiful card. 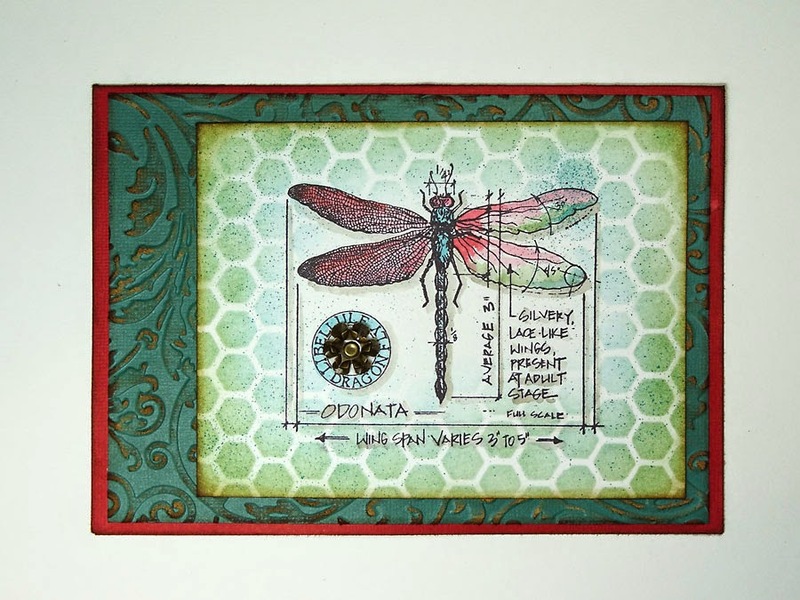 Gorgeous backgrounds to showcase this dragonfly stamp image. Love the colors and texture you've created.